Welcome to Wikipedia's Energy portal, your gateway to energy. This portal is aimed at giving you access to all energy related topics in all of its forms. The Sun is the source of energy for most of life on Earth. 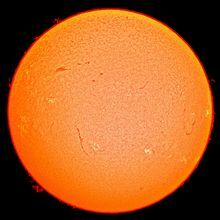 As a star, the Sun is heated to high temperatures by the conversion of nuclear binding energy due to the fusion of hydrogen in its core. This energy is ultimately transferred (released) into space mainly in the form of radiant (light) energy. Living organisms require exergy to stay alive, such as the energy humans get from food. Human civilization requires energy to function, which it gets from energy resources such as fossil fuels, nuclear fuel, or renewable energy. The processes of Earth's climate and ecosystem are driven by the radiant energy Earth receives from the sun and the geothermal energy contained within the earth. Coal is a readily combustible black or brownish-black rock composed primarily of carbon and formed from plant remains. It is the world's largest single source of fuel for electricity generation, and its fastest growing energy source. It is also the world's largest source of carbon dioxide emissions, one of the key greenhouse gases that are believed to be the primary cause of global warming. The use of coal dates back to the Bronze Age, but it was the Industrial Revolution that led to its large-scale use, as the steam engine took over from the water wheel. Today world coal consumption is about 5.3 billion tonnes annually, of which about 75% is used to produce electricity. The region including the China and India uses about 1.7 billion tonnes annually, forecast to exceed 2.7 billion tonnes by 2025. The United States consumes about 1.0 billion tons annually. Almost one-third of all coal used was supplied by China in 2005. Electricity ionizing the gas in a plasma lamp. During World War I, the German Army produced shale oil from Yarmouk oil shale deposits in Jordan to operate the Hijazi Railway (pictured)? Dennis Spurgeon, formerly chief operating officer at uranium supplier USEC Inc., became the United States Assistant Secretary for Nuclear Energy in 2006? Japan Canada Oil Sands Limited was the first offshore oil company to exploit the Athabasca oil sands in Canada? Teesside Power Station is the largest combined-cycle gas turbine (CCGT) plant in Europe.? The Klaipėda Geothermal Demonstration Plant in Lithuania was the first geothermal plant in the Baltic Sea region? Hitachi Zosen Corporation built the first oil tanker in Japan in 1908 per an order by Standard Oil Company? Coalbed methane is a form of natural gas extracted from coal beds? When constructed in 1906, the Baku–Batumi pipeline was the world's longest kerosene pipeline? James E. Hansen (born March 29, 1941) heads the NASA Institute for Space Studies and is currently an adjunct professor in the Earth and Environmental Sciences department at Columbia University. He is best known for his testimony on climate change to congressional committees in the 1980s that helped raise broad awareness of global warming. Hansen studied at the University of Iowa, obtaining a B.A. in Physics and Mathematics, an M.S. in Astronomy and a Ph.D. in Physics. He was elected to the National Academy of Sciences in 1996 and received the Heinz Environment Award for his research on global warming in 2001. Hansen is a vocal critic of the Bush Administration's ideology on climate change. In 2005 and 2006, he claimed that NASA administrators have tried to influence his public statements about the causes of climate change. He has also claimed that the White House edited climate-related press releases from federal agencies to make global warming seem less threatening, and that he is unable to speak 'freely', without the backlash of other government officials. The Wall Street Journal reports that former Enron CEO Jeffrey Skilling, released from prison in February after serving 12 years for fraud and insider trading following Enron's 2001 collapse, is planning a return to the energy business, helming a "digital platform connecting investors to oil and gas projects". (The Wall Street Journal).